The Crew van comes with a three person passenger bench seat behind the driver and co-driver seats. We want to use that room for a living area, so we have to move the seat back. 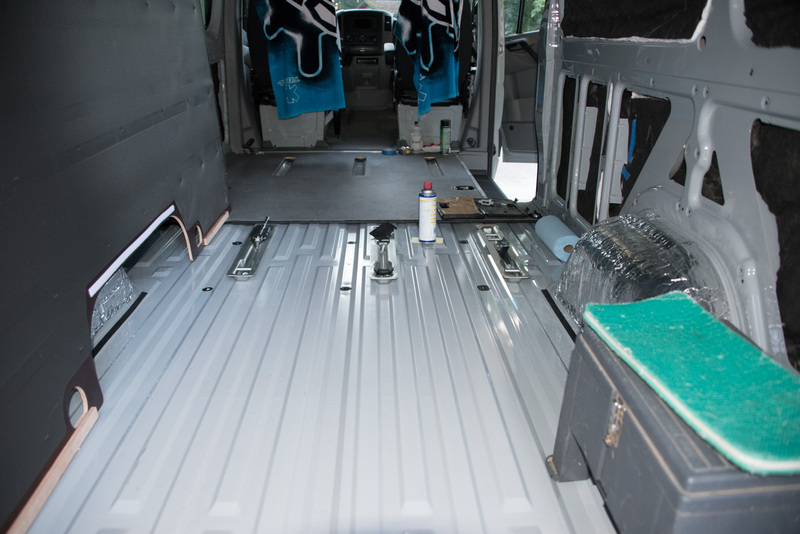 Luckily, the 2015 crew vans come with captive nuts under the floor in the positions the seats would take in a passenger van. It’s weird — Mercedes puts the nuts in place, but then puts a solid metal floor right over them. If you know exactly where to drill, it is possible to cut through the top layer of metal and discover the nuts. As it says in this thread on the Sprinter-source forum, each set of nuts is 858mm back from the set in front. Measure carefully, then drill a small pilot hole to check you’re in the right place. If you get it slightly wrong, you carry on drilling through a thick layer of metal – the edge of the nut. Here’s what that looks like. We were some of the first people to test out the measurements in the forum post. The first set of measurements that got posted weren’t quite right. We ended up drilling in to the edge of the nut, and then we had to re-measure and drill a second hole in the right location. 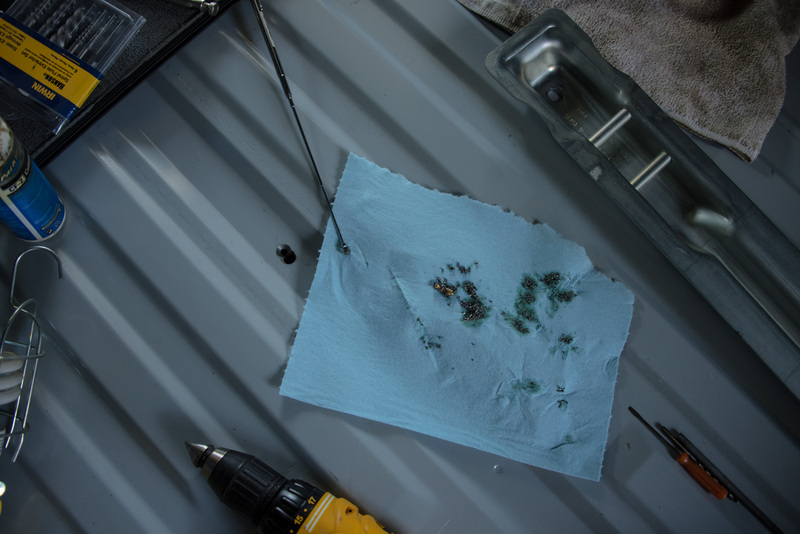 If you get it right (858mm per seat position), you drill through a thin layer of metal – the van floor – and then into the center of the bolt hole. You can use a flashlight to check that you’ve hit the middle of the captive nut that’s welded underneath. Then you just carefully enlarge the hole with a step drill. We put the seats back to the third passenger row. 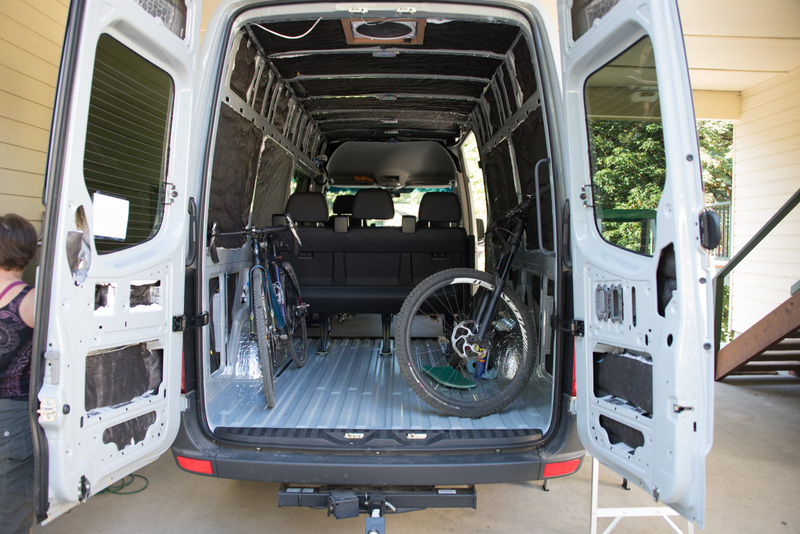 In a 170″ wheelbase van, that gives us plenty of room for a living area, and *almost* enough room for the bikes behind the seats. Six inches further forward would have been perfect, but we’ll put up with the slight lack of space. Getting the seats mounted in a different position would cost a lot of money and needs someone with good liability insurance. Some people have created a one-and-a-half position seat by drilling the rear hole of one seat position and the front hole of the seat position behind it. This involves also drilling a new hole in the seat mounting plate. It’s explained fully in the forum post. You’ll have to cut some holes in the wooden van floor to clear the seat mounts. Here’s how we did it, using the indentations in the rubber floor mat to mark the locations, then tracing the shape of the cut-outs using the existing holes in the front section of the floor. Did you move the three trays yourself or can you order a cargo/crew with a removable bench in the third row position? We want to add two removable captains chairs behind the driver/passenger and have removable 3rd row in a 170 4×4. We moved the bench mounting points (what you are calling trays) ourselves. That’s why we had to drill through the van floor to locate the captive nuts. You can’t order a cargo with benches in it. You can order a van with “seat prep” which gives you the mounting points but not the benches. However, I think it would be hard to find a dealer who can make the MB ordering system create that order for you. Your only other option would be to order a passenger van, then sell the seats you didn’t need. That seems a bit crazy though. For your situation, you’re probably best off buying a crew van, then moving the bench mounting points back to the third position yourself. It’s not hard. 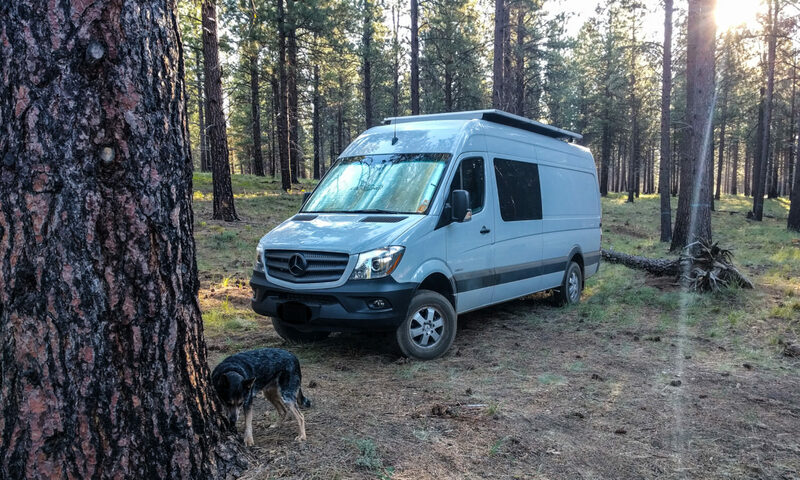 This post gives you the general directions, and there’s a thread you should read on the Sprinter forum too. Once you’ve moved the bench seat back, you can add the captain’s chairs in the first passenger row. I have no idea how to securely mount captain’s chairs, but I know some people have done it. 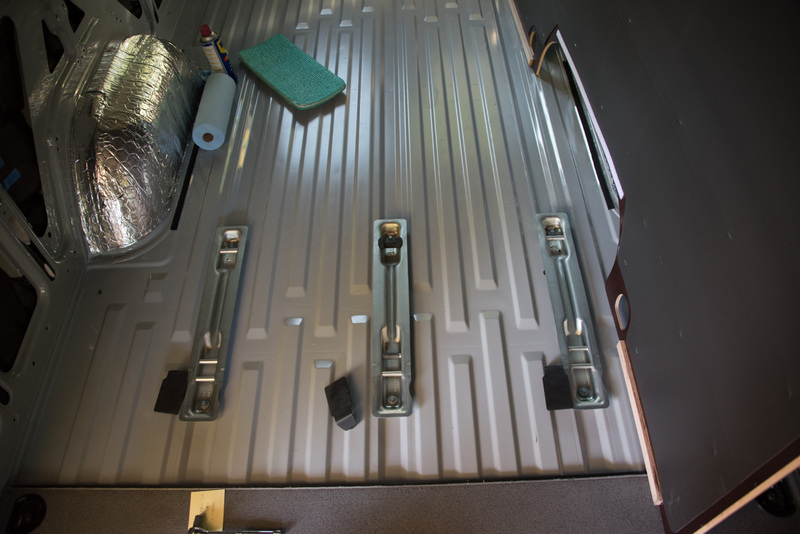 Be prepared to add metal plates under the floor if you want a safe system. I take it that the 3 seat row is a MB row seat correct? If so what is the height of the seat from the coin flooring to the top of the back of the seat minus the head rest? Thanks! The seat height is 35-3/4″ to the head rest mounts, BUT the seatbelt attachment points make little humps that are 38-3/4″ from the ground. Also, remember my coin is around 1/2″ higher than the stock floor because of the rubber mat, etc. I added to the floor. So, short answer is that the seat is ~39-1/4″ tall above the stock van wooden floor.